Your Mom was a lovely lady with a bright personality. 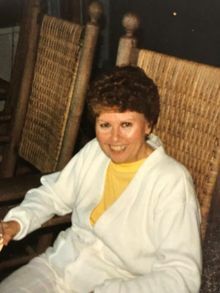 When I recall the family visiting days in Manchester or at your parents home, what comes to mind first and foremost when I think of your Mom, was her accent. I always thought it sounded really neat and unique and like no one else in the family! As I learned later in my growing years, was that it was a representation of the Canadian connection that we all happen to share in our family lineage. So, in looking back, it was your Mom's accent that I'll always think of fondly! I will always remember her fun spirit at our family get togethers and her devotion to family. Take comfort, Donna, in knowing that your parents are together again! Donna - So very sorry to learn of your mom's passing. I worked with her at NH Insurance Company for many, many years. I remember when i brought my daughter in after she was born and she was crying. Elsie held her and she stopped and she laughed and said she had the magic touch. That memory always sticks in my mind. After the company closed, she would still buy Avon from me and we had great conversations when i delivered her order. She so loved her cat, Oreo and always talked so lovingly of you. I know this is such a very, very difficult time for you - my Mom had Alzheimers and was at Villa Crest also when she passed. Know your mom will always be with you in spirit and treasure the sweet, beautiful times you had together. Donna - Sorry for your loss. Had so many wonderful times while working at NH Ins. with your mother and father and friends.